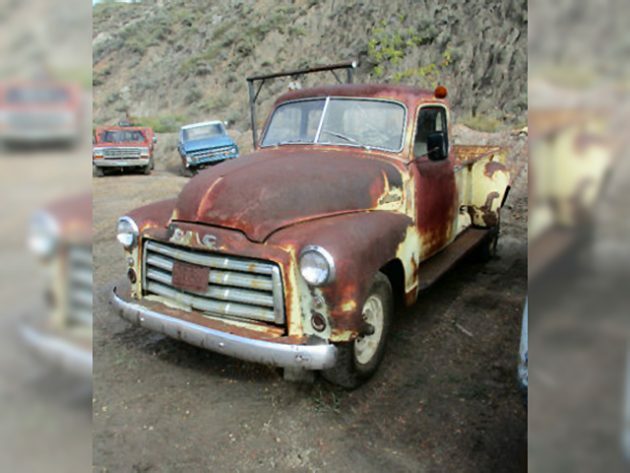 This 1950 GMC 250 Deluxe Pickup will need some work. Actually, it’ll need a lot of work, but these are fairly rare pickups with the 1-ton rating, and having the 5-window Deluxe cab makes it even more special. Did I mention that it also has a dump box?! 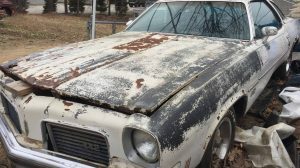 This one is listed on Kijiji website with an asking price of $1,850. Thanks to Dean K for this submission! The GMC, or Chevy for that matter, 1-ton pickup had a longer box than the 1/2 ton models, at 9-feet in length instead of 6-feet. These were meant to be work trucks, and buyers paid good money for the extra hauling capacity. Someone also paid good money for the Deluxe 5-window cab. This is one tough truck! Speaking of that, this truck also has a “twin cylinder dump box hoist”, that’s got to be fairly unusual. 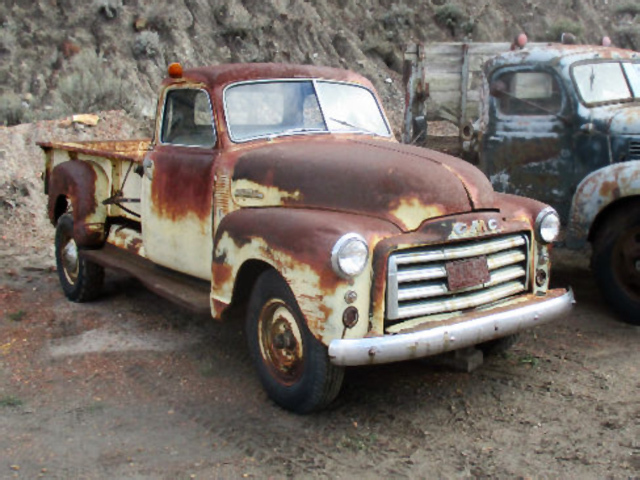 The seller says that this was an Alberta, Canada farm truck and you can see that it’s basically covered with surface rust. 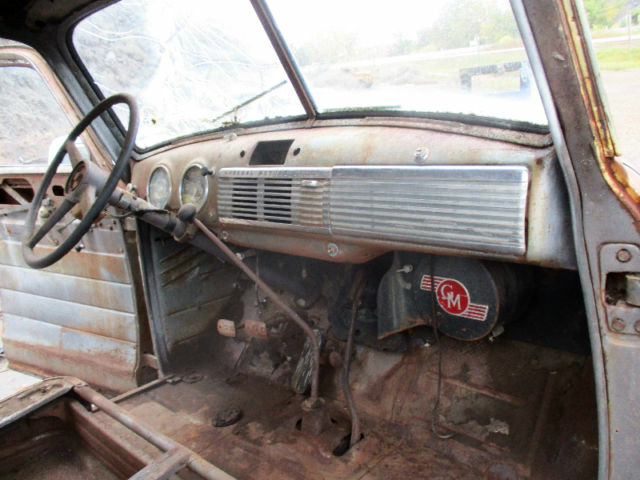 There are also pin holes in the floors but the cab corners, cab mounts, doors, and rockers are good. This isn’t one for the faint of heart, but if you’ve been hankerin’ to practice with that welder that Santa just brought you a few days ago, here’s your chance! I believe that this truck has split-rims, so watch out with those. The interior doesn’t look half bad, does it? I mean, for a 67-year old 1-ton work truck that’s been in Canada working hard for all 67 of those years. I’m guessing that you’ll want to at least put the ol’ wire brush on the drill or air-tool and go after these floors and then coat them and maybe even Dynamat them to quiet things down a bit before putting down some 2″ thick wool carpet. No, you’ll get a replacement rubber floor mat for this one, this isn’t a modern, posh, latte-in-every-cupholder pickup! This is a 228 cubic-inch inline-six with around 96 hp. 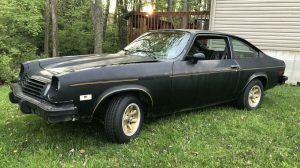 The bad part about this otherwise decent-looking engine compartment is that the seller says that this engine does not run and it’s probably stuck. That’s a needle-across-the-record moment. I know that the vast majority of the Barn Finds family of readers could have this six-popper running like new again in no time. There’s enough real world talent and experience here among the readers to tackle any problem that we can throw at you! What are your thoughts on this 1-ton GMC? 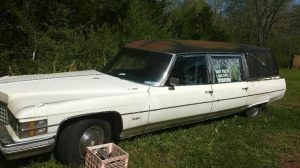 Can it be saved? 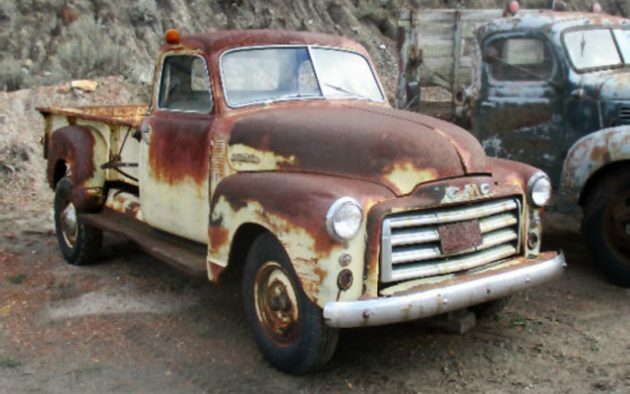 Well, at least the price is plausible( not 7 grand, although, it may end up there) I read, all Canadian GMC’s built before 1953 had the 216 motor, not the 228 like US models. 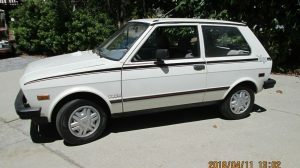 ( or Canadian Chevy’s) This appears to be the 216 ( with oil cap on valve cover) While it looks like a dump box, I don’t see any controls inside for it. If so, a definite plus. I only hope someone takes advantage of our good friends to the north pricing for the masses, but I fear, it’s too tempting, and someone will flip this. Looks lie a good base to work from. I’d be tempted to put a flatbed on it and retain the dump option. For reliability, a generic 350 and auto trans is hard to beat if you want to use it. Tons of parts available including full cabs, so anything is rebuildable. $8k for a full cab. Well worth rebuilding what you need. I would quite enjoy the body work on this. It looks like in one of the pictures on the website that there may be a lever sticking out of the side of the box behind the drivers side of the cab which may be the control to raise the box, my eyes are not the best but that is what it looks like to me. Cool Truck. JW the control lever is to the right of the stick shift. 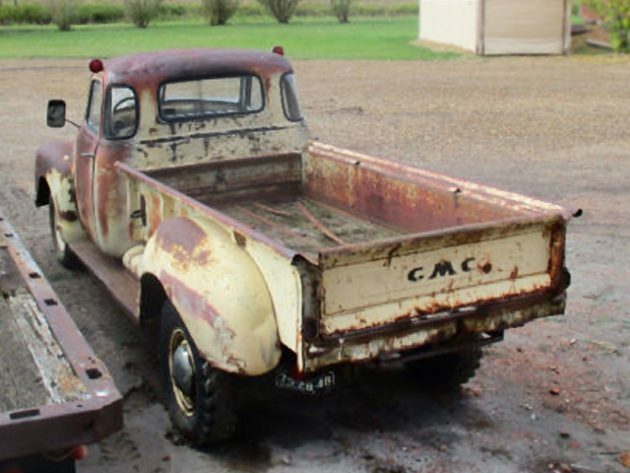 My Grandfather had a 51 and a 52 GMC 2 ton grain bed dumpers and the controls were right there, very simple pull back it lifted, shove forward the bed came down. Drove those trucks may of times during harvest season on the farm. Almost bought one after he sold the farm just to have, but my Dad said no. The lever to the right of the gearshift is the parking brake lever. 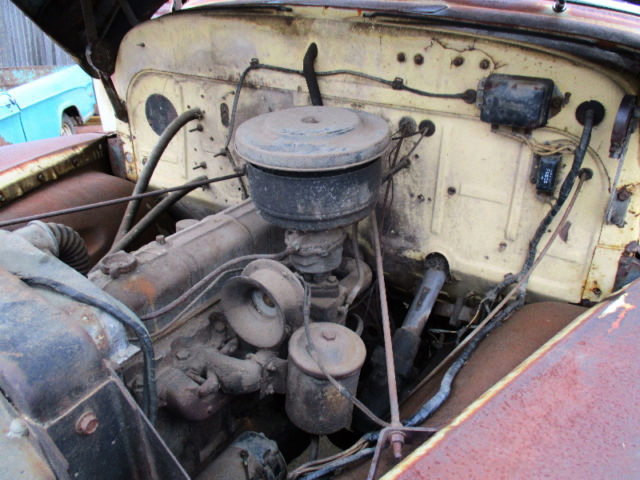 The cable to engage the PTO probably is mounted in the lower right of the central dash – counterpart to the ignition switch location, where the cigar lighter normally is. I have a 48 1-1/2 ton. All the fun you can have at 45 miles per hour….